Preserve your health alongside your shooting skills by training with these 147 grain Blazer Clean-Fire 9x19mm rounds from CCI. 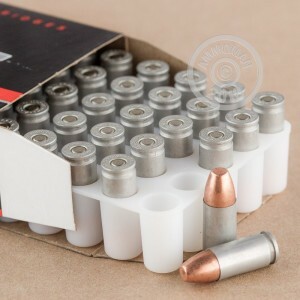 This bulk case of 1000 rounds ensures you'll have plenty of match and practice ammo and ships free from AmmoMan.com. CCI is a well-recognized brand in both reloading components and finished ammunition and they have combined different technologies from their related companies in order to offer this health-saving line of ammo. Blazer Clean-Fire cartridges use non-reloadable aluminum casings fitted with CCI's Clean-Fire primers which produce no toxic chemicals when ignited. To add to this effect, the rounds use 147 grain Speer Uni-Cor bullets which are completely lead free. These bullets act like total metal jacket (TMJ) rounds leaving no trace of lead in the air for you to breathe nor any residue in your firearm for you to inadvertently ingest during cleaning and handling. The bullets' weight profile matches that of the most popular 9mm Luger defense ammunition and extends this training benefit with a flat-nose (FN) tip which leaves clean holes on paper and cardboard targets. From a four inch barrel, these TMJ-FN rounds have a muzzle velocity of 985 feet per second which only drops to 938 feet per second at 50 yards. These lower speeds make this ammo a great choice for use with sound suppressors.